Here's a unique take on the Svengali deck, allowing you to so much more to amaze! The original has been popular for a long time, and for good reason. Now, with this new Blank Svengali deck, the miracles you can perform are greatly multiplied! A double blank Bicycle Svengali deck, hand made by Gafftastic. EXCLUSIVELY for Kaymar! This deck is a mentalist's and magician's dream. It makes it possible for you to force pictures, words, numbers, symbols, songs, movies, bands, actors, celebrities, and anything else in a totally hands-off fashion. 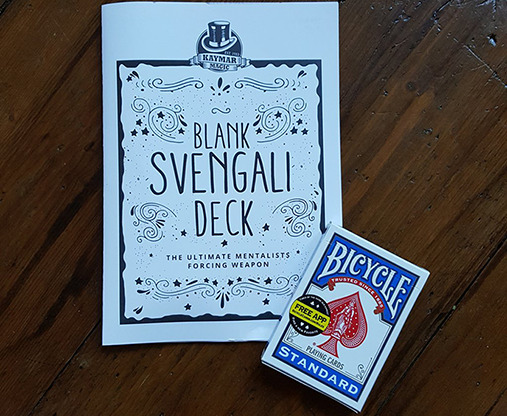 The Blank Svengali deck -- start enjoying the Svengali deck in a whole new way!